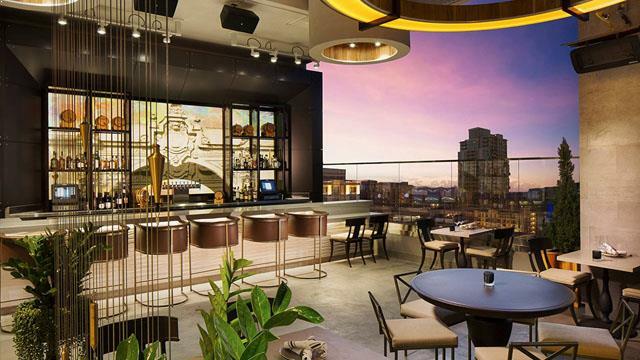 A complete guide to the 12 best rooftop bars in San Diego in 2019. 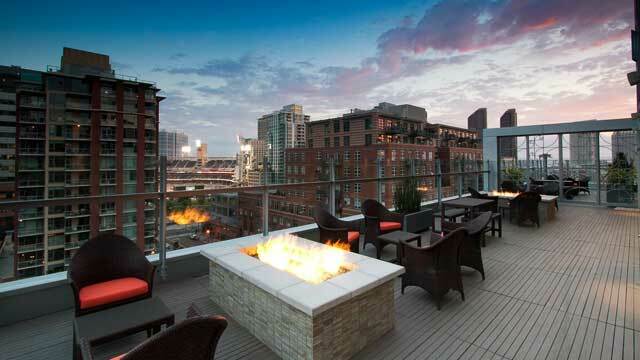 So, which is the best rooftop bar in San Diego? Here you'll find the best San Diego rooftop bars with all info you need about each place. Opening hours, dress codes, pics, maps and much more. 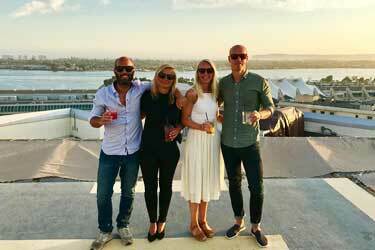 San Diego is a perfect city when it comes to great roof terraces. The warm climate, ocean and skyscrapers combines in a great way. 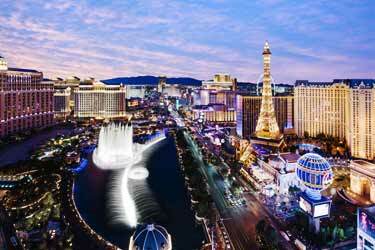 Here you can find both luxurious rooftop swimming pools and fancy restaurants in the sky. 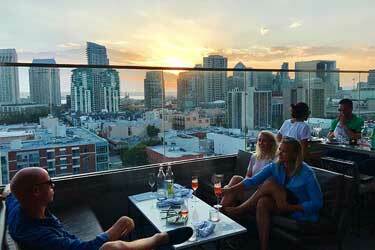 Scroll down and find the San Diego rooftop bar best suited for you. Or use the San Diego rooftop map in the bottom right corner. A classic and lovely lounge spot, located on the 9th floor of Hotel Indigo in the Gaslamp Quarter of downtown San Diego. From the Level 9 terrace you get a spectacular view of the city skyline and also the PETCO Park baseball stadium. The wooden deck rooftop terrace is open-air and very charming, decorated with a mix of classic lounge sofas and bar stools, cosy fire-pits and a cool outside bar. Here you can order delicious and imaginative signature cocktails, exciting crafted brews and some tasty bar bites. Stunning San Diego rooftop bar that with its double-terrace setup offers one of the most impressive views the city has to offer. From one terrace you can catch beautiful sunsets over the ocean and Coronado Island, and also see into the Petco Park arena, and from the smaller terrace on the opposite side you get lovely vistas over the skyline. Decorated with lounge sofas, cosy fire-pits and front row bar stool seats, the rooftop has a vibrant, sophisticated atmosphere, perfect for fun after works or just some relaxed lounging. 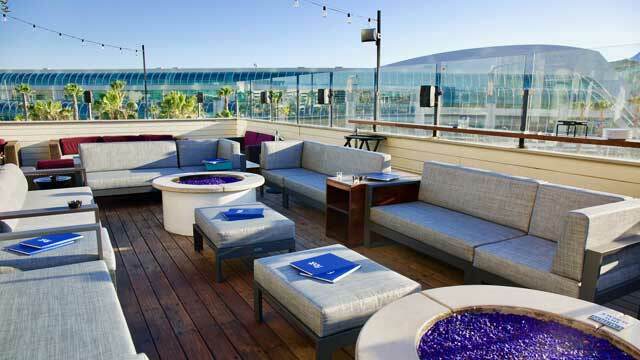 Modern and trendy, The Nolen rooftop bar offers spectacular city views, from the Coronado Bridge to Point Loma. Located 14 floors up in the Gaslamp Quarter of downtown San Diego, The Nolen specializes in stunning and well-crafted cocktails. A true paradise for cocktail-lovers, with selections ranging from timeless classics to Nolen Originals. Complemented with a set of delicious bar bites, beautiful in design, and a sophisticated and swanky lounge in ambience, this is a perfect spot for a fun night out with a group of friends. Located on the 7th floor at the hotel Andaz San Diego, and up here you get an absolutely magical 360-degree view of the San Diego skyline. Both rooftop restaurant and bar, offering American fare with a creative SoCal twists from lunch and onwards, along with a wide range of signature cocktails, local beers on draft, wines and bottle service. Relaxing lunch and lounge on weekdays, while on weekends the space transforms into a high-energy, chic nightclub. Also home to one of San Diego's best rooftop pools, available to hotel guests or by renting a cabana. San Diego's largest oceanfront rooftop and a fantastic place, especially if you are a fan of great Sushi and panoramic ocean views. Located right on Mission beach, the rooftop terrace might only be two floors up, but it still offers one of San Diegos best ocean views. Spacious and modern, Cannonball rooftop offers lots of different seatings, from regular dining tables to cosy lounge areas with fire-pits. Casual, relaxing and fun in vibe, this rooftop almost feels like a beach club and some evenings local live bands play. A charming and genuine Italian rooftop restaurant and bar, located on top of the La Plaza shopping center in La Jolla. Stylish and modern in decor, the indoor reastaurant expands to a lovely rooftop terrace with both dining area and a more narrow part with a cool, dual indoor-outdoor bar. Open seven days a week, Catania offers authentic Italian coastal cuisine for lunch and dinner, an Italian wine & craft beer program and cocktails like 'Italian Mule' and 'Amalfi Coast'. Complemented with ocean views and a relaxed and friendly vibe. 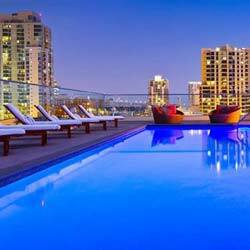 Check out our list of the best rooftop pools in San Diego. 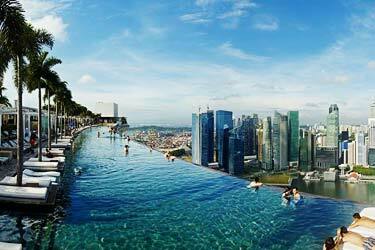 Some amazing swimming pools with dazzling city views. Don't miss out on this when visiting San Diego! Located in downtown San Diego, just west of Balboa Park, this may very well be the best place in the city to combine fine dining with views to die for. Long time runner and famous for it’s attentive service, fantastic food and beautiful views, the terrace at Mister A's also offers a chance to catch the airplanes landing and taking of from San Diego airport. Serving crafted cocktails, a top-rated wine list and modern American cuisine for lunch, dinner and Sunday brunch, Mister A's is a great spot for celebrating special occasions. 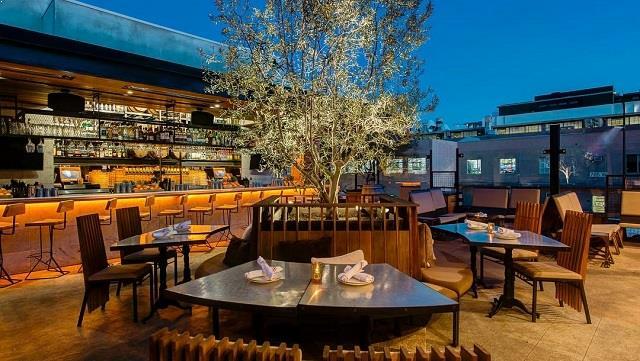 Great in design and atmosphere, Kettner Exchange is a trendy and chic rooftop bar and restaurant, located in the Little Italy part of downton San Diego. 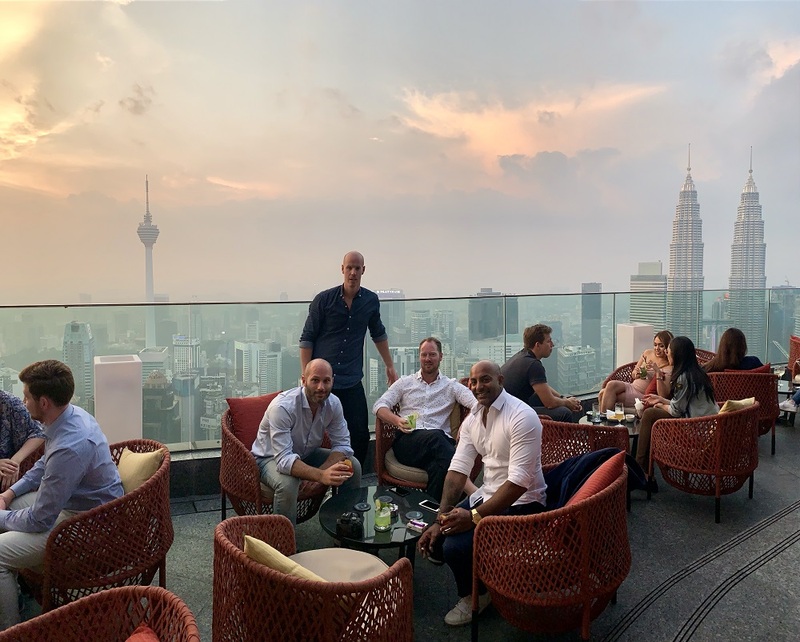 Boasting two levels of outdoor and indoor drinking and eating, the views are not panoramic, but location near the airport means can catch airplanes flying over the terrace, which is cool. Maybe not reason enough to visit, but the wide-range food menu o new American dishes and cocktail list of hand-crafted and creative creations sure are. Beautiful and trendy, but managing to also be fun and friendly. Both a relaxing poolside lounge and a trendy rooftop bar, perched on the 4th floor of the Kimpton Solamar Hotel in the Gaslamp Quarter. With a brand new look and new name since 2017, this spacious roof terrace is now one of the more stylish San Diego has to offer. Open daily and decorated with stylish lounge sofas, cosy fire pits, private cabans and a beautiful rooftop pool. Enjoy a full day of lounging or visit for signature cocktails, bites from the ground floor restaurant Jsix and outdoor games. 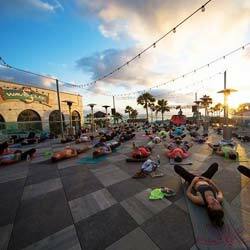 Yoga during the morning and drinks during the evening, check out our list of the best rooftops for some yoga in San Diego. Amazing places to relax at with yoga and views. Located at the Hotel Republic San Diego, not on top, but as a spacious 3rd floor terrace. 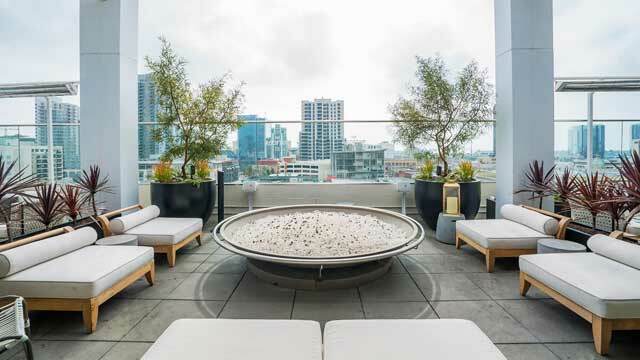 Specializing in happy hour, small bites, and weekend brunch, this rooftop lounge is a relaxing oasis in the heart of downtown San Diego, offering cool views amid the city sky scrapers. Open daily and to all, Topside Terrace is trendy in decoration with its lounge couches, fireplaces and cabanas. Relaxing and chill in vibe, this is a great spot for a pre dinner cocktail, long and loungy hours in the sun or for a great rooftop brunch. Spacious and stylish terrace, complete with one of the best rooftop pools San Diego has to offer. 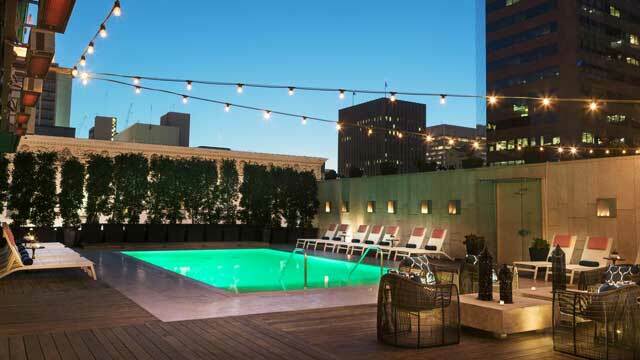 Located at the Hotel Palomar in downtown, the pool is open year round to guests staying at the hotel, while the rooftop bar is seasonal, and a real summer hot-spot. Four levels up, the terrace is surrounded by sky scrapers and decorated with a mix of comfy sun beds and stylish lounge furniture. 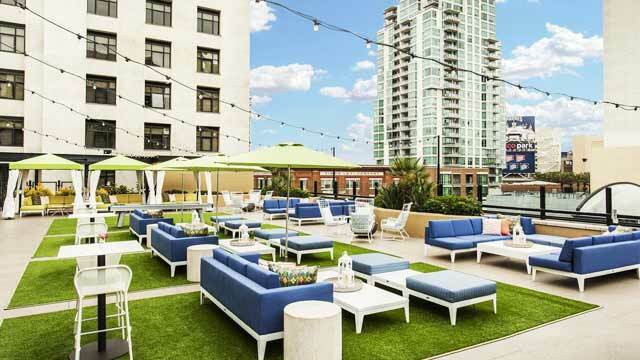 The rooftop bar offers delicious and well-made cocktails along with tasty bites along with weekend vibes under the San Diego summer sun. 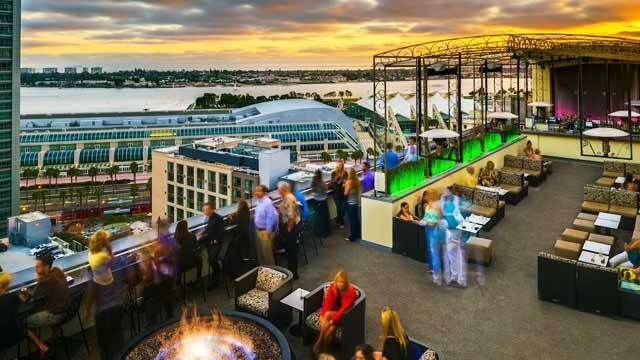 Perched on the 4th floor of the Hard Rock Hotel San Diego, this large rooftop bar overlooks the Gaslamp Quarter's. The terrace comes with a stylish rooftop pool, private cabanas and a lounge area with comfy sofas and fireplaces. A stylish oasis during daytime, where you can lounge poolside or rent private cabanas for rooftop swimming. Higher vibes with live DJs and a trendy crowd during evening, and also during the summer Saturday's 'Sunburn Pool Party'. Discover the biggest collection of San Diego activities, guided tours and skip-the-line tickets. Anything you want you'll find right here. 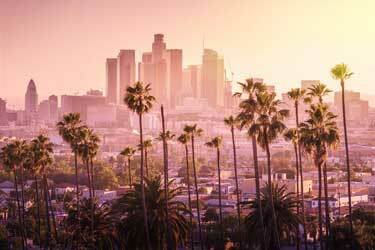 Which are the best rooftops in San Diego? 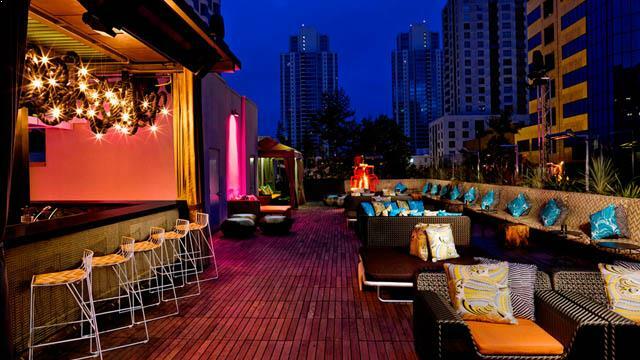 This complete guide will help you find the best rooftop bars in San Diego. The temperature here is between 15-25 degrees celsius all year round, resulting in that the best rooftop bars in San Diego can stay open all year. 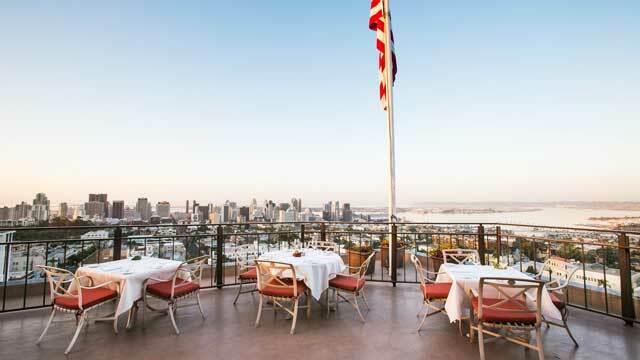 The downtown San Diego rooftop bars are often luxurious, with magical views of the city skyline. From some terraces the view is often over the baseball stadium, so you might actually catch a glimpse of some live baseball. 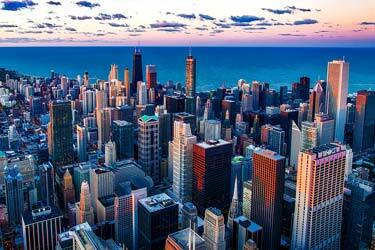 Given the nice climate, the city's skyscrapers and the fantastic atmosphere in California, San Diego is a superb city regarding rooftop bars. 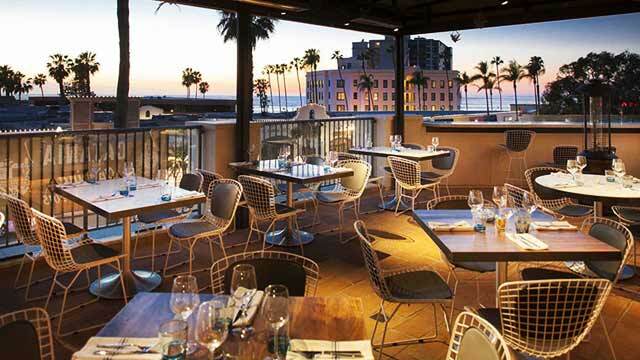 The roof terraces in San Diego are very popular, and you do best in booking a table in advance when trying to visit any of these view spots. At our map on this site you can find the best rooftop bars in San Diego that are closest to your location. 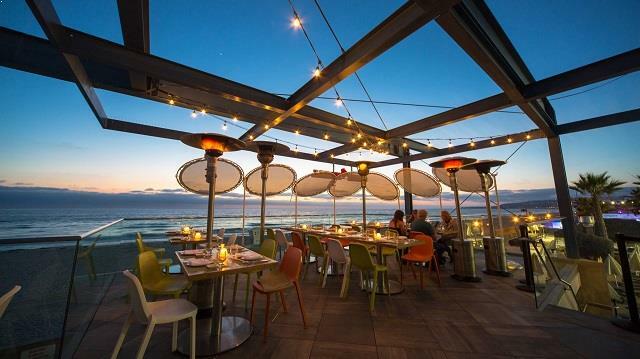 A typical San Diego rooftop is located at a hotel or restaurant, with a locely ocean view. San Diego is located in southwestern California right on the Pacific Ocean and the border with Mexico. 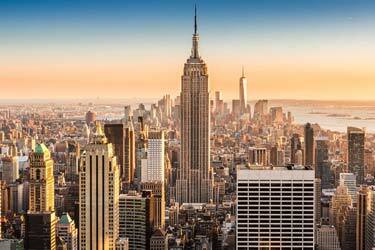 It counts as America's 8th largest city. Given the proximity to Mexico, the Mexican culture has put a bit of a mark on the city. In the southern parts of the city, Spanish is the most common language.